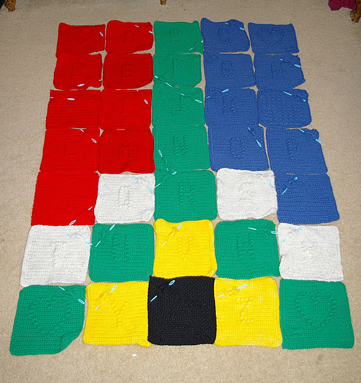 These delightful crocheted squares alphabet squares make warm, solid squares. They are perfect for spelling words or making a complete alphabet blanket. Although the graphs make the letters look a little strange, they look normal on the finished square. Graphs are available in the ABC graphs PDF. Puff Stitch (ps): yo, pull up a loop 4 times, 9 loops on hook, yo, pull thru 8 loops, yo, pull thru 2 loops, push puff to front of work, work next st. Note 2: Ch 1 and turn at the end of each row. 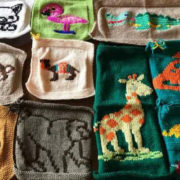 There are 26 stitches in each row and 32 rows. Note 3: Work the square reading the chart from the bottom. Read the right side rows from right to left and the wrong side rows from left to right. Row 1 starts the right side. 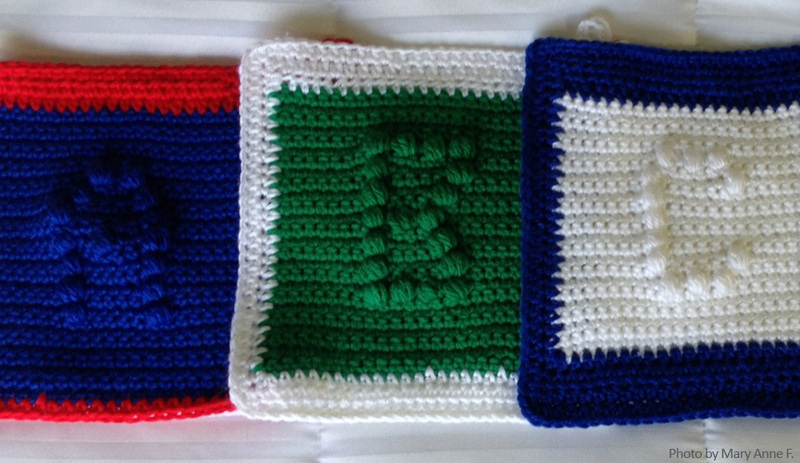 Note 4: If the first square is shorter than 8” (20cm), add an additional row of single crochet. 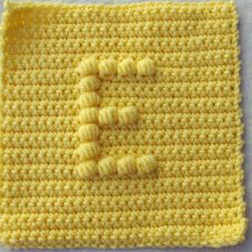 Note 5: If the square is smaller than 8” (20cm), add an edging of single crochet, remembering to increase 3 sc at each corner. Note 6: When you fasten off, leave a 20” (50cm) tail which is used for sewing the squares together. These are the instructions only. Please download the ABC graphs.pdf for the complete alphabet in graph form. 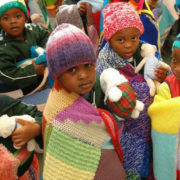 An ABC blanket made using the colours of the South African flag would be a delight for a child. Leave a 20” (50cm) tail (for sewing the squares together). Butterfly the tail to the square.